Have you ever picked up a hot pan and then scrambled to sit it down before you burned your hand? Well no more. My designer potholders and oven mitts are made with 5 full layers of protection + a colorful designer trim. They protect your hands and fingers even at high oven temperatures. There is no right or wrong side – you are equally protected on each side – all around. Designed to be used by either a right or left handed person. All can be machine washed using warm water, tumble dry low, and have a hanging loop. This fabric is called “Love” and features a black background with the word “Love” written all over it in white, pink, and red colors. The perfect print for Valentines Day, Sweetest Day, Mothers Day, or as an engagement or shower gift. 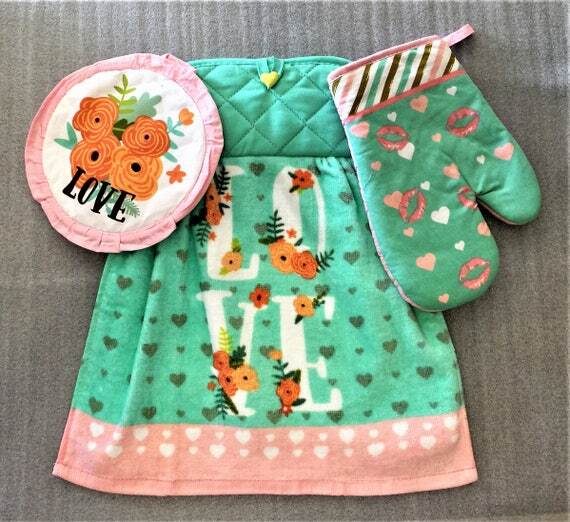 The oven mitt is lined with a coordinating fabric. I added red cording trim to highlight the print – white or black cording trim is also available. Great gift for that someone special! THIS SET WILL ADD A WONDERFUL DECORATIVE TOUCH TO ANY KITCHEN. 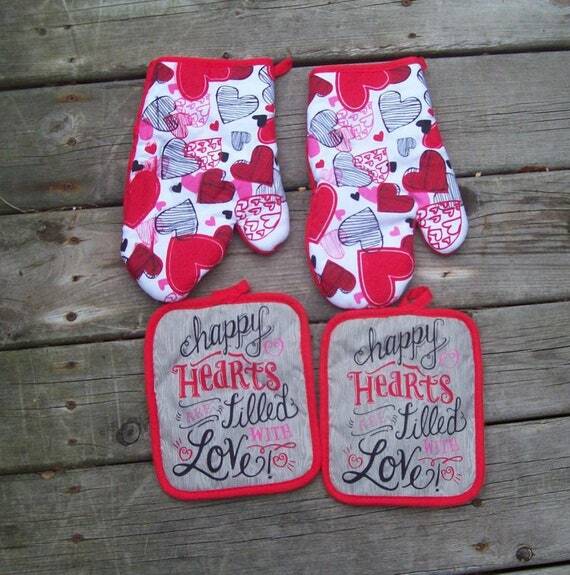 IT INCLUDES 1 DECORATIVE TOWEL, 1 MATCHING OVEN MITT AND 1 MATCHING POTHOLDER. HANG THE TOWEL ON THE OVEN DOOR HANDLE, DRAWER HANDLE, OR TOWEL RACK. UNDO THE BUTTON TO ATTACH, SECURE, AND NO MORE PICKING YOUR TOWEL UP OFF THE FLOOR! TOWEL FEATURES 2 LAYERS OF THICKNESS FOR EXTRA ABSORBENCY AND DURABILITY. MACHINE WASH AND DRY. THANKS FOR LOOKING! MADE IN A SMOKE FREE HOME. Perfect Set for Every Day or Valentine’s Day! 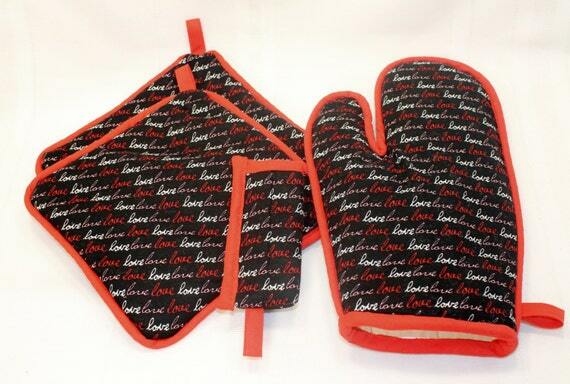 ~ Oven Mitts are standard Adult Size and Pot Holders are approximately 6 x 6 inches. All of us know that LOVE is that special ingredient that makes all the difference with baking and cooking. 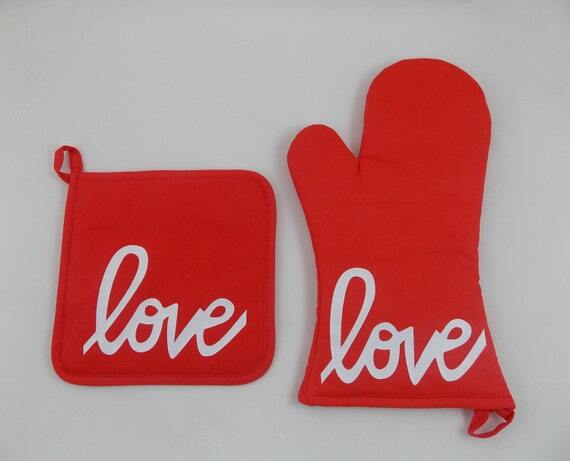 Remind yourself of this with this playful oven mitt and pot holder set! This line of oven mitts and pot holders is exclusively manufactured for Graceful Works. The design on the lining on the inside is our copyrighted design.